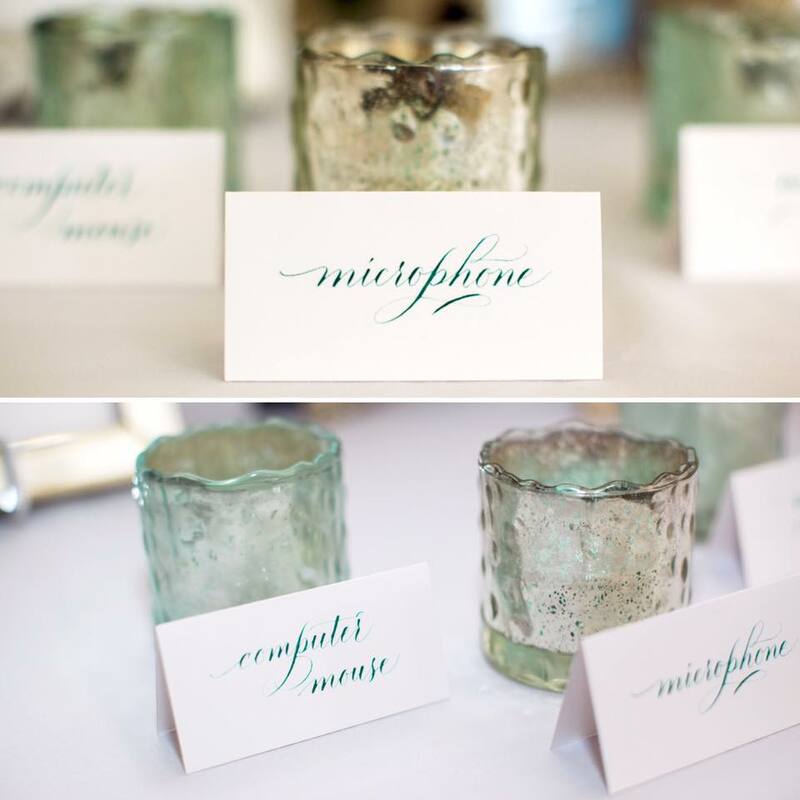 Younghae Chung is the left-handed Copperplate calligrapher behind Logo Calligraphy + Design. In addition to being a successful lettering artist, Younghae is also a gifted teacher of the craft, offering workshops around Southern California. She has also published a beautiful set of Copperplate Practice Pads – for lowercase and uppercase letters – to help others in their practice! We are so happy to have Younghae with us as a Calligrafile Contributor. I think we will all benefit from her insights, especially the lefties out there who may be struggling to find just the right pen holder or pen-to-paper angle! 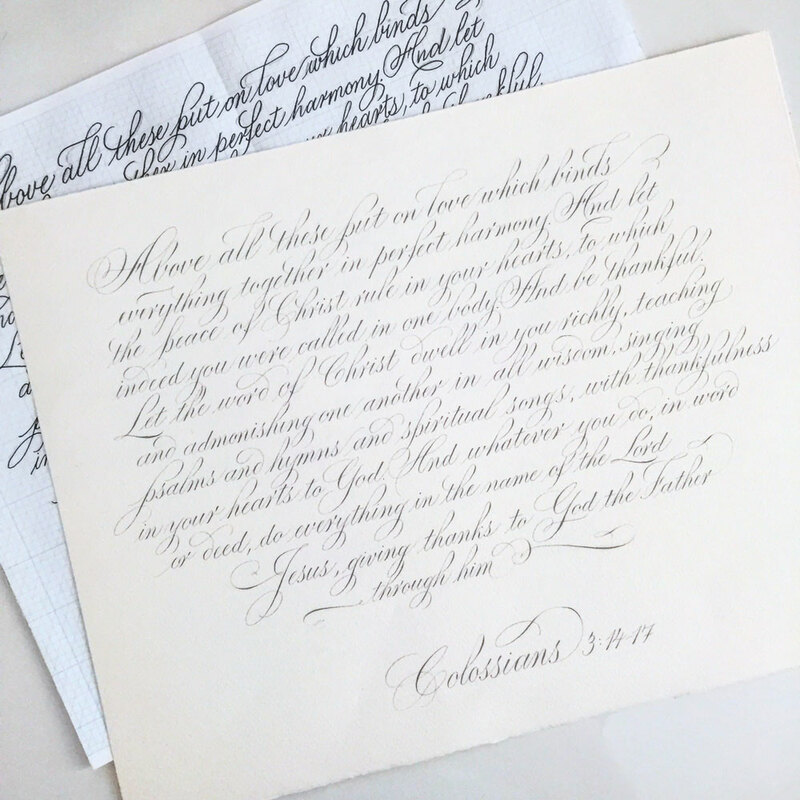 I interviewed Younghae via email to find out about her start in hand lettering and just how she uses an oblique holder as a left-handed calligrapher. Our family was living in Orlando, Florida (USA) temporarily in 2014. With family issues and health problems for our 8 month old son, that transition year was probably one of the most difficult seasons in my life. I remember one day, I looked around our living room and had a deep desire to hand letter words of hope, faith, and encouragement. I believed that if I saw those words on a daily basis, it would powerfully change my mindset and heart. I had taken an italic class in college and remembering how much I enjoyed it, I google searched “local calligraphy class in Orlando” and an advertisement for a “Copperplate Calligraphy Workshop” came up through a local art store. I had no idea what “Copperplate” or “pointed pen” was at that time. All I saw was the ad and fell in love with the elegance and beauty of the script. I knew I wanted to sign up. Meeting my instructor Kaye Hanna really helped jumpstart this journey on the right path. She taught her class with grace, encouraged community over competition, introduced me to IAMPETH (The International Association of Master Penmen, Engrossers, and Teachers of Handwriting), and inspired me to continue practicing and invest time into this art. Since then, whenever i had spare time (usually at nights), I buried myself in her worksheets to practice almost everyday for the first year. There was something so therapeutic and healing about slowing down to write letters with a pen and ink. I knew my life was forever changed by this newfound passion. 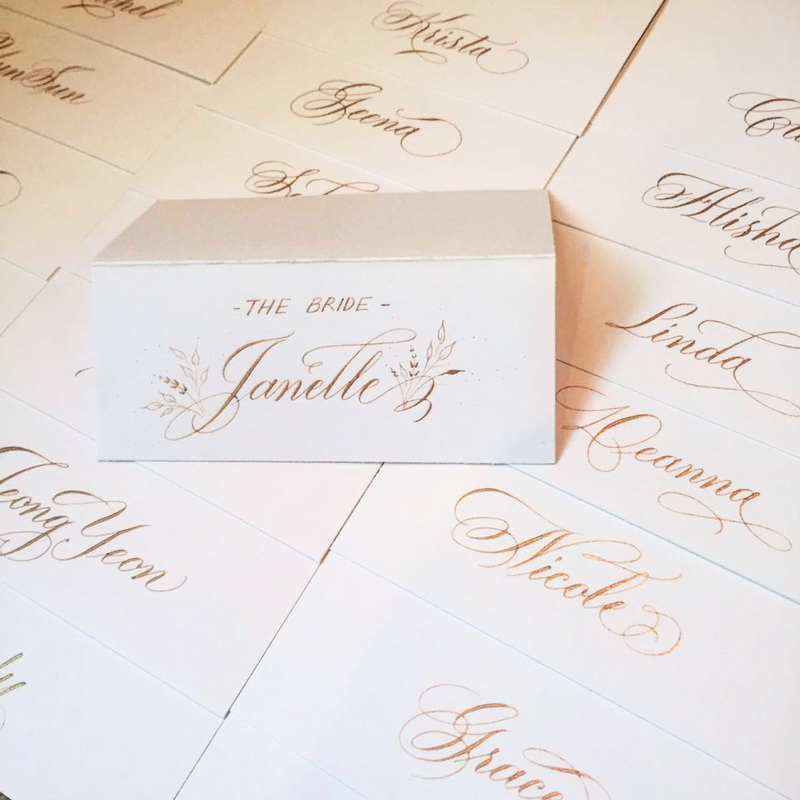 In 2015, because of my husband’s job, we moved to Irvine, California and being in Southern California really opened up many opportunities to connect with other calligraphers and resources! With a desire for more formal training, I signed up to be a member of IAMPETH and started taking more courses. 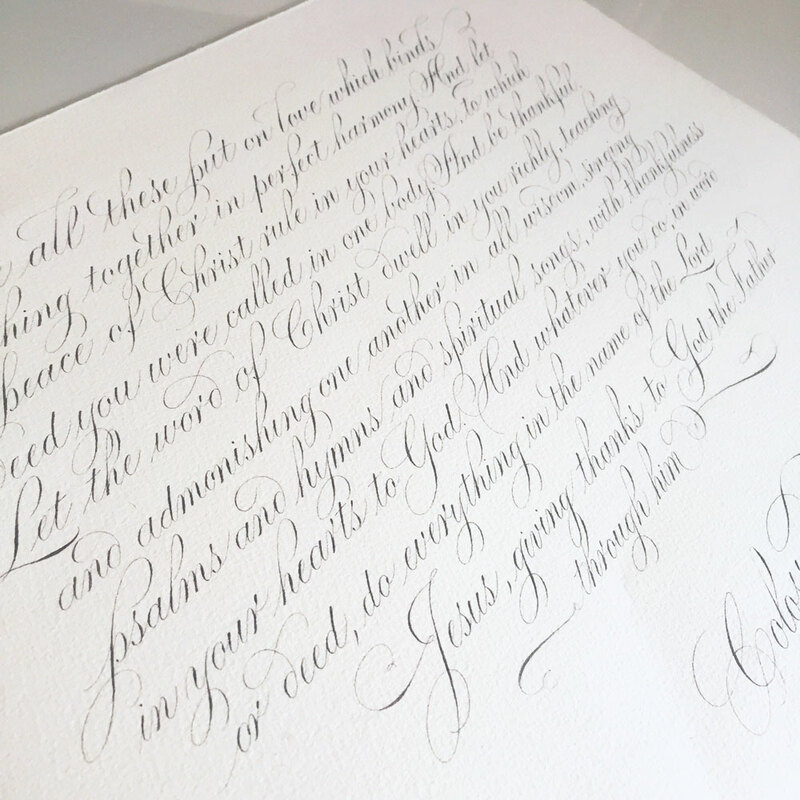 I had the privilege of learning Spencerian from Master Penman Harvest Crittenden and Master Penman Michael Sull, Engrossers Script from Master Penman Barbara Calzolari, and wonderful instructors from the IAMPETH Convention in Portland, Oregon this past summer. I consider myself a lifetime student of this art and believe there is always something to learn from somebody. You’re a lefty! And you are known to use an oblique holder! Can you tell us more about this combination? I actually spent most of my first year writing with a straight holder. I remember feeling so frustrated because I could not figure out how to write with an oblique as a lefty! However, on Valentines Day 2016, I went to the Los Angeles International Pen Show with a couple of friends and met Master Penman Michael Sull for the first time! He graciously took the time to show me his recommendations of how to angle the paper and hold the oblique pen as a lefty. He mentioned that writing with an oblique will help increase my range in motion. Ever since then, I started practicing with an oblique and had to get used to the dramatic 90 degree paper turn. If you see me write in person, you will notice that I write sideways, towards my body. The transition from a straight to an oblique holder wasn’t as hard as I thought because I already knew how to make the basic strokes of Copperplate calligraphy. I forget who encouraged me to teach, but I kept hearing the shop Oh Hello Friend and decided to email the shop owner with a quick bio and a couple of pictures of my work. A couple of days later, I got an email that she would love for me to come into her shop and I remember squealing with excitement in our church's parking lot. That first experience meeting Instagram friends/strangers was unforgettable. I realized how much I valued the in-person interactions and the joy I had of teaching others what I love. I’ll be teaching my tenth workshop in a couple of weeks and I often wonder where I would be if I didn’t email Oh Hello Friend. Sometimes opportunities may knock on your door, but there are times you need to proactively put yourself out there and take risks. I like this quote: “I'd rather fail trying than succeed at doing nothing” (Denis Waitley). I recently went to a creative event where I heard that "people who have a low view of themselves cannot have a high view of others". It's so important to surround yourself with people who can dream big alongside you and be the first to cheer you on when you hit those milestones and accomplishments. I don’t think we are meant to do this apart from community. Engage with people, check out pen meets, get involved with a local guild, network with people in your industry and cheer others on. I look at my dad, an entrepreneur and a businessman for over 30 years, and admire the level of loyalty and trust between him and his clients. That loyalty was built after years of investing into the right people. My first response is learn to SAY NO. I have a problem with overbooking my schedule too, but I find that when I’m stretched too thin, the projects and deadline become more of a burden than a joy and I don’t want my work to come from a place of burnout/exhaustion. As a creative freelancer, its easy to work around the clock like a machine, so I recently started taking a break from social media and that has been so freeing! Getting off social media and the need to perform/work has given me the time to be present with the people around me and that in turn, reminds me of why I do what I do. I recently finished my longest commission order for a newlywed couple! It was an 11x18 piece with over 90 words (see below). The most challenging part of the process was sketching out the overall design and layout of the piece. I usually take a graph paper, measure the dimensions, mark the center lines, and start sketching with a pencil. Because some lines were shorter than others, I experimented with flourishes to fill in the negative white space. Overall, I was pleased with how it turned out and learned so much through it! All my handcrafted pen holders made by Heather Held, Master Penman Michael Sull, and Hoang Dao; vintage Esterbrook nibs, The Universal Penman for incredible flourishing ideas, a light pad, and my favorite: a pencil. Hmmm. I went through many short lived hobbies (photography, baking, fitness), but if it wasn’t for calligraphy, I think I would have enjoyed being a hair stylist haha! My husband would joke and tell people to go to “Young Haer Salon”. I remember doing french braids for my entire volleyball team before tournaments in high school, cutting my own hair and giving haircuts to my friends in college, and enjoy cutting my husband and boys’ hair when I can. I see hair styling as a form of art and love seeing the transformation of before to after.